Milan 09: German designer Stefan Diez launched Houdini, a plywood chair for German brand e15 in Milan last month. The chairs are made using a technique borrowed from model aeroplanes, with the plywood shell glued to a solid frame. The chair comes with and without armrests. 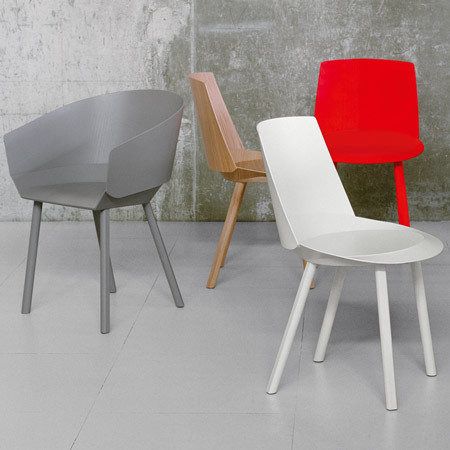 E15 unveils the first two items of the new chair family HOUDINI in Milan, a side chair and chair with armrest. Both chairs are made from 4mm thin oak-veneered plywood using an unusual production methodology. The outcome is a new silhouette of wooden furniture where the chairs’ back and seat run in bent curves around the base forming a seat shell. Inspired by a technique used in aeroplane model making, two-dimensional plywood slabs are stretched by hand around a complexly milled solid wood ring to form the back and another to form part of the seat. No nails or screws are used to hold the chairs together rather the 2D slabs are glued to the base to stay in position, producing the shape of the chairs. Both chairs are available in natural oak, black, white and grey lacquer finishes as well as custom colours. In Milan e15 will also present the side chair and chair with armrest with partial and complete upholstered options.